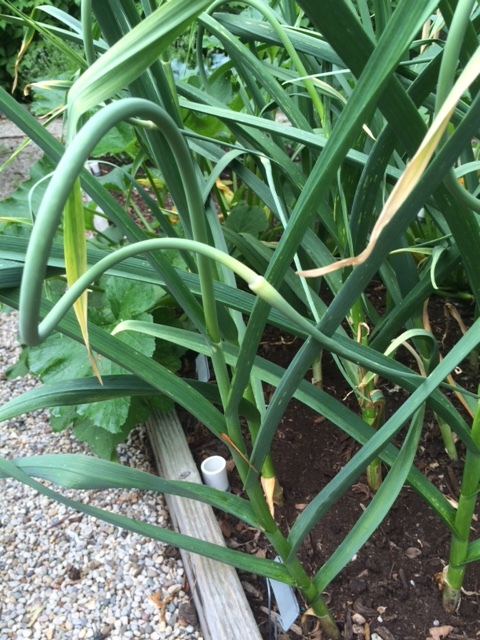 Last Fall I planted two varieties of garlic in one of my raised beds: German Extra Hardy from Seed Savers Exchange and some unknown variety from a local nursery. They quickly sprouted a few weeks later and I just let the garlic rest and do its things over the rest of the Fall and Winter. Even after being covered with tons of Cleveland snow, they all perked back up and continued to grow through early Spring. Over the past few weeks, the prized scape started appearing on the plants. 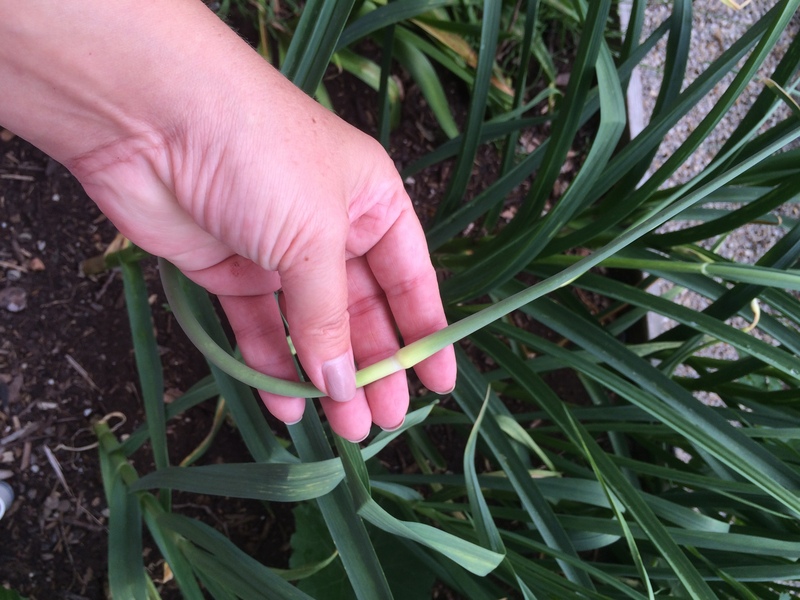 The plant shoots up this scape with a pointed flower bud on the tip–it comes from the middle of the plant and is very firm and curvy. By trimming the scape off at the base, you have 2 major benefits. One, it pushes the plant to send more of its energy into growing the bulb in the soil below. Two, you get to eat these deliciously garlic-y jewels. You don’t have to have your garden to enjoy these–just visit your local farmers market or you may even get lucky at your Whole Foods. I’ve eaten them two ways… chopped and sauteed in a pan with butter and mixed into pasta. The second way is here, in the form of a pesto. Mixed with parmesan and pistachios, the resulting pesto definitely has a lot of garlic flavor to it, but it doesn’t feel like it’s coming out of your pores like when you eat too many raw cloves of garlic in a dish. It’s the perfect alternative to a traditional basil-based pesto. You could use this garlic scape pesto on its own smeared on a cracker or piece of bread or in a simple pasta dish or mix a bit with some quickly blanched green beans or asparagus. In this treatment, I decided to take it a step further and use it as a pizza sauce. The results were amazing. We started by grilling our pizza dough on one side–I find that always creates the crispiest results when making pizza at home. We then smeared a thin layer of the pesto on top and topped with shredded mozzarella and sprinkle of chili flakes. In a 500 degree oven, we put the pizza directly on the bottom rack (grilled side down) and cooked for about 5 minutes. Once the cheese was melted but not browned at all yet, to really make it decadent, we topped the pizza with a fresh cracked egg. Back in the oven for another few minutes and voila–bubbly, garlic-y, cheesy, and creamy homemade pizza. Blend the first 4 ingredients until all is finely chopped in a blender or food processor—I used my new Vitamix, which I deeply love. Once very fine, slowly drizzle in the olive oil with the motor running. Add a tbsp. or two of water to get the texture you desire. Divide the pizza dough into two rounds and let rest in an oiled bowl at room temperature covered with a kitchen towel. Let the dough rise slightly and come to room temp—at least an hour. Pre-heat your outdoor grill to high and indoor oven to 450 degrees. Make sure you have an oven rack in its lowest setting in the oven. Take each round and roll out as thin as you like. I like super thin. Brush 1 side of each dough round with vegetable oil to prevent sticking. Sprinkle with salt. Lower your grill to medium (if using gas, of course) and place dough rounds on the grill directly, oiled-side down. Cook until nice and brown and crisp and bubbles form on the top. Do not flip over! Remove from grill and place on a work surface or pizza wood peel. Cooked side down, smear the pesto on the top. 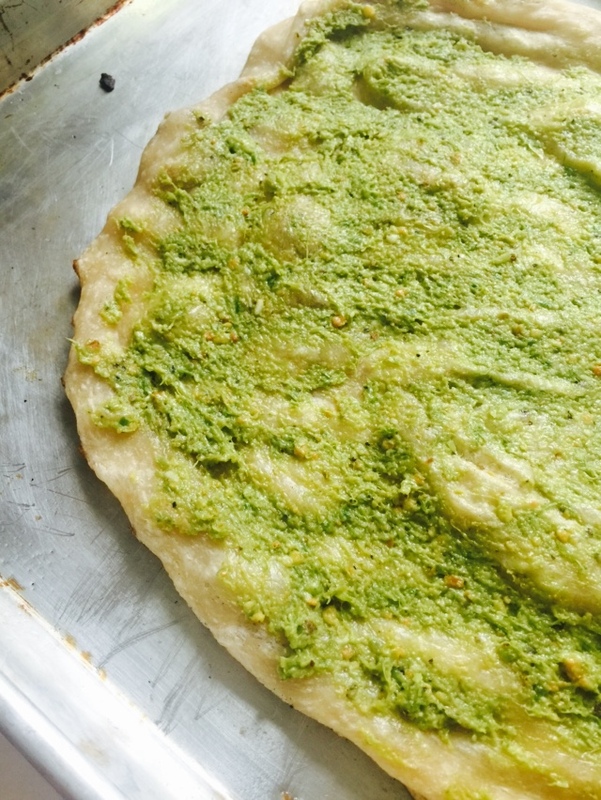 You will not use all of the pesto from the recipe above—I’d say about 1/3 of it in total for both pizzas. Top each pizza with ½ of the shredded cheese and sprinkle with chili flakes. Cooking one pizza at a time, place the pizza directly on the bottom rack in the oven. This will assure that the bottom will stay crisp while the cheese starts to melt. About 5 minutes later, the cheese should be melted but not browning yet. Remove from the oven and crack an egg in the middle. VERY carefully place the pizza back on the bottom rack. 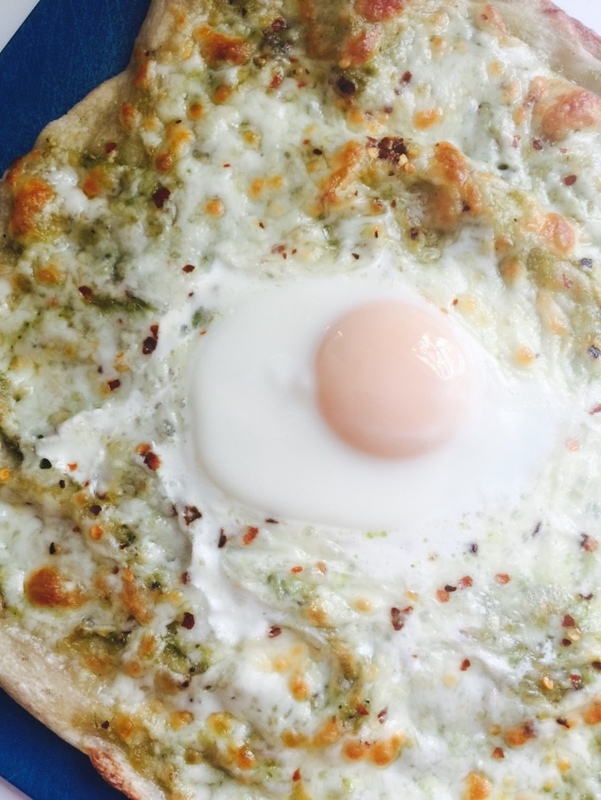 You want to make sure the egg doesn’t slide off and make a mess of your oven! Cook approx. another 5 minutes—but it could be quicker. Keep an eye on it. You’re looking for the cheese to start to brown and the egg to just begin the set. You want that egg yolk super runny. Remove from the oven when ready. Let rest about 2 minutes, slice and serve.